M48 Highland Sgian Knife combines the design of a traditional Scottish dagger with contemporary materials. The 5 ¼ inch 2Cr13 stainless steel blade features a non-reflective black oxide coating with a satin surface grind. This 9 ½ inch knife features three through holes on the blade and a shiny stainless steel guard. The black TPR handle has been ergonomically contoured for a comfortable fit. They include a rugged polypropylene belt sheath that has a double-layered strap to hold the Sgian securely in place. 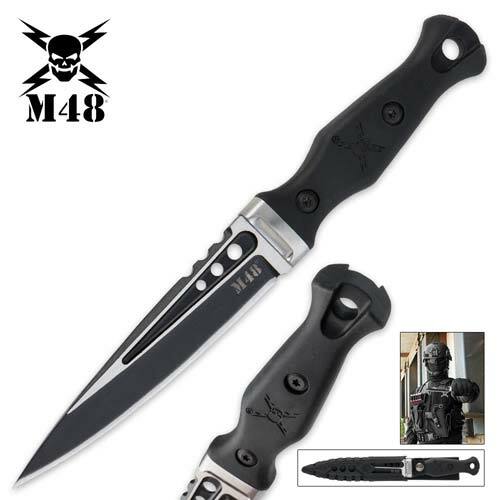 Buy the M48 Highland Sgian Knife for only $49.99.